Let's face it, the new Nest Cam wasn't probably on your Black Friday radar because the cost of the unit is hardly in its hardware, but in the somewhat needed Nest Aware subscription. If you're willing to put down $100-300 per year on that, a few saved bucks here and there won't make that much of a difference. But since we're thrifty people and we think every dollar counts, we'll tell you about this Nest Cam discount anyway. The Wi-Fi connected security camera has dropped to $170 on every online retailer's store: Nest Store, Google Store, Amazon, Best Buy, Newegg, and Walmart. That's $30 less than its original price, and $5 lower than the $175 it went for a few days ago on Amazon and Walmart. 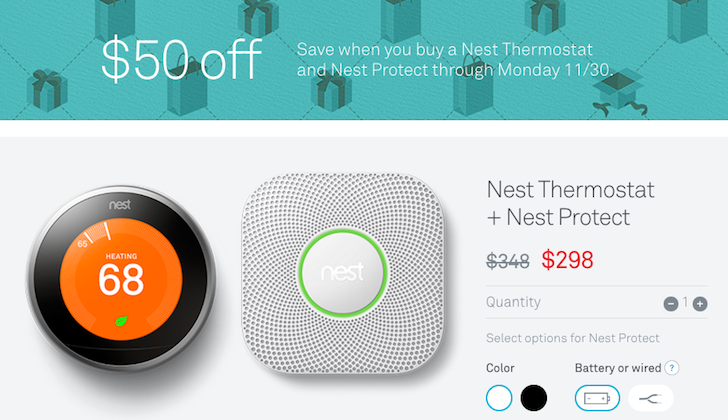 The more interesting deal in my opinion is the one over the Nest Thermostat ($249) and Nest Protect ($99) bundle. If you buy both from Nest's online store, they'd usually cost you $348 but Nest is shaving $50 off to get the price down to $298. Not bad. You have until Monday to make up your mind on either of these deals and start turning your house into a connected smart home for slightly cheaper than usual.